Denon releases D-F107DAB+ mini hi-fi system | What Hi-Fi? 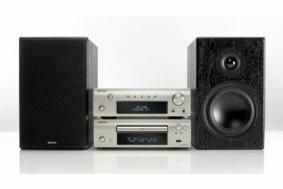 The system allows playback from CD, iPod, USB and FM/AM/DAB/DAB+ radio. Its DRA-F107DAB stereo receiver packs a newly-developed power amplifier delivering a claimed 2 x 65W, while the DCD-F107 CD player uses a high-precision 24-bit, 192kHz digital-to-analogue converter. If you decide to buy the system with Denon's own SC-F107 speakers, you'll find they incorporate technology derived from the firm's high-end CX concept, and they've been tuned for European tastes. Each speaker has a 14cm cone woofer and 25mm tweeter. The CD player's front USB port includes 'iPod direct' connectivity, and users can play MP3 and WMA music files stored on other devices. An ASD-11R docking station is optional. Other key features include a MM phono stage, newly developed remote control, two-line display and CD-R/CD-RW playback. The Denon D-F107DAB+ system will be available in September.